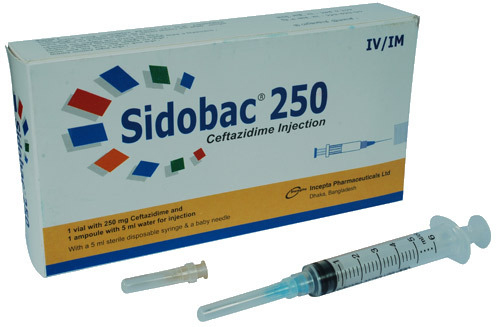 Sidobac 250 mg Injection: Each vial contains Ceftazidime USP 250 mg (as a mixture of Ceftazidime pentahydrate and Sodium Carbonate) for IV/IM injection. 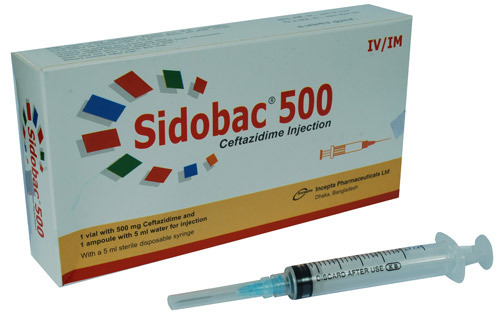 Sidobac 500 mg Injection: Each vial contains Ceftazidime USP 500 mg (as a mixture of Ceftazidime pentahydrate and Sodium Carbonate) for IV/IM injection. 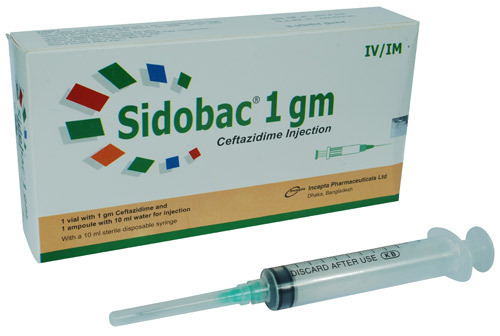 Sidobac 1 gm Injection: Each vial contains Ceftazidime USP 1 gm (as a mixture of Ceftazidime pentahydrate and Sodium Carbonate) for IV/IM injection. Ceftazidime is a semisynthetic, broad-spectrum, beta-lactam antibiotic for parenteral administration. Ceftazidime is bactericidal in action exerting its effect by inhibition of enzymes responsible for cell-wall synthesis. A wide range of gram-negative organisms is susceptible to ceftazidime in vitro, including strains resistant to gentamicin and other aminoglycosides. In addition, ceftazidime has been shown to be active against gram-positive organisms. It is highly stable to most clinically important beta-lactamases, plasmid or chromosomal, which are produced by both gram-negative and gram-positive organisms and, consequently, is active against many strains resistant to ampicillin and other cephalosporins. Lower Respiratory Tract Infections, including pneumonia, caused by Pseudomonas aeruginosa and other Pseudomonas spp., Haemophilus influenzae, including ampicillin-resistant strains; Klebsiella spp. ; Enterobacter spp. ; Proteus mirabilis; Escherichia coli; Serratia spp. ; Citrobacter spp. ; Streptococcus pneumoniae; and Staphylococcus aureus (methicillin susceptible strains). Skin and Skin Structure Infections caused by Pseudomonas aeruginosa; Klebsiella spp. ; Escherichia coli; Proteus spp., including Proteus mirabilis and indole-positive Proteus, Enterobacter spp. ; Serratia spp. ; Staphylococcus aureus (methicillin susceptible strains); and Streptococcus pyogenes (group A beta-hemolytic streptococci). Urinary Tract Infections, both complicated and uncomplicated, caused by Pseudomonas aeruginosa; Enterobacter spp. ; Proteus spp., including Proteus mirabilis and indole-positive Proteus, Klebsiella spp. ; and Escherichia coli. Bacterial Septicemia caused by Pseudomonas aeruginosa, Klebsiella spp., Haemophilus influenzae, Escherichia coli, Serratia spp., Streptococcus pneumoniae, and Staphylococcus aureus (methicillin susceptible strains). Bone and Joint Infections caused by Pseudomonas aeruginosa, Klebsiella spp., Enterobacter spp., and Staphylococcus aureus (methicillin susceptible strains). Intra abdominal Infections, including peritonitis caused by Escherichia coli, Klebsiella spp., and Staphylococcus aureus (methicillin susceptible strains) and polymicrobial infections caused by aerobic and anaerobic organisms and Bacteroides spp. Central Nervous System Infections, including meningitis, caused by Haemophilus influenzae and Neisseria meningitidis, Pseudomonas aeruginosa and Streptococcus pneumoniae. Dosage: The usual adult dosage is 1 gram administered intravenously or intramuscularly every 8 to 12 hours. The dosage and route should be determined by the susceptibility of the causative organisms, the severity of infection and the condition, and renal function of the patient. Infants & Children (2 months - 12 years): 30-100 mg/kg/day IV to a maximum of 6 grams per day Q 8-12h. Impaired Hepatic Function: No adjustment in dosage is required for patients with hepatic dysfunction. Impaired Renal Function: In patients with impaired renal function (glomerular filtration rate [GFR]<50 mL/min) it is recommended that the dosage of Ceftazidime be reduced to compensate for its slower excretion. In patients with suspected renal insufficiency, an initial loading dose of 1 gram of Ceftazidime may be given. Administration: Sidobac may be given intravenously or by deep IM injection into a large muscle mass such as the upper outer quadrant of the gluteus maximus or lateral proof of the thigh. Intra-arterial administration should be avoided. For IV/IM administration, Sidobac should be constituted with the supplied Sterile Water for Injection. The most common side-effects are local reactions following IV injection and allergic and gastrointestinal reactions. Hypersensitivity reactions are pruritus, rash, and fever. Angioedema and anaphylaxis have been reported very rarely. Gastrointestinal symptoms are diarrhea, nausea, vomiting, and abdominal pain. Central nervous system reactions included headache, dizziness, and paresthesia. The total daily dosage should be reduced when Ceftazidime is administered to patients with renal insufficiency. Ceftazidine should be prescribed with caution in individuals with a history of gastrointestinal disease, particularly colitis. Pregnancy: No adequate and well controlled studies in pregnant women have been conducted with Ceftazidime. Because animal reproduction studies are not always predictive of human response this drug should be used during pregnancy only if clearly needed. Lactation: Ceftazidime is excreted in human milk in low concentrations. Because many drugs are excreted in human milk and because safety of the component of the injections in nursing infants has not been established, a decision should be made whether to discontinue nursing or to discontinue the drug, taking into account the importance of the drug to the mother.